Dr Regina Eisert, marine mammal expert at the University of Canterbury's Gateway Antarctica, still can’t believe the underwater footage her team captured on a recent Antarctic expedition to study killer whales. “I’m such an excited scientist right now!” Dr Regina Eisert, marine mammal expert at the University of Canterbury's Gateway Antarctica, still can’t believe the underwater footage her team captured on a recent Antarctic expedition to study killer whales. “The whole whale glides past – this is such a lucky shot!” she says as she watches her computer screen. With a serenity that belies its massive size, a minke whale floats gracefully through the frame. 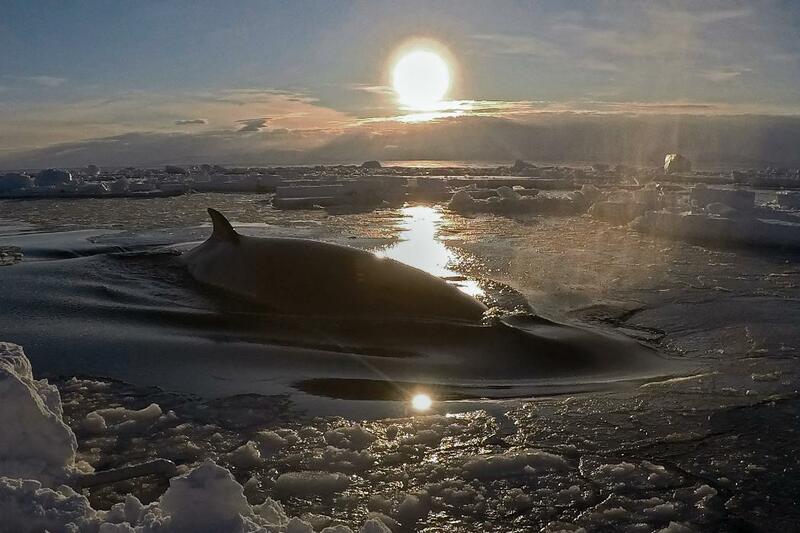 Little is known about Antarctic minke whales that can grow up to 10m long and weigh 9 tonnes. Dr Eisert believes this may be the first time a minke whale has been filmed underwater, and in the sea ice, in the Ross Sea. Dr Eisert is particularly excited as she didn’t think anything had been captured on a new prototype underwater camera designed by Antarctic film expert Anthony Powell of Antzworks. “The plan was to film continuously across the icebreaker channel that is prepared for the re-supply vessel to cross McMurdo Sound. The water’s so clear, you can see right across the 50-80m lane and monitor all the whales that use the channel,” Dr Eisert says. Dr Eisert’s research programme focuses on fish-eating (Type C) killer whales, but she also became interested in minke whales when she realised that they are champions of ice navigation, beating even the Type-C killer whales in their ability to infiltrate deep into McMurdo Sound. According to IWC estimates, there are about 180,000 minke whales in Area V, the area of Southern Ocean that includes the Ross Sea region. Dr Eisert says while this species is likely to be an important part of the Ross Sea food web, little is known about their precise role in the ecosystem. Minke whales are also the only whales that are still hunted in the Southern Ocean, ostensibly for scientific purposes. But there are other ways to study whales that cause no harm, such as photo-identification and dart biopsies. When a minke swims by, Dr Eisert and her team take photos and a skin sample using a small dart. “We can learn so much from a small tissue sample, such as their diet – we think they just eat krill, but do they eat small fish as well? Also, DNA analysis can tell us whether Ross Sea minkes are separate from other minke whales on the Antarctic Peninsula or further north or if they are all part of one larger population,” she says. As filter feeders that primarily target krill, minke whales feed low in the food web and follow the retreating sea ice to find the richest feeding grounds, Dr Eisert says. The Ross Sea region MPA came into effect on 1 December 2017. It covers 1.55 million square kilometres and is the world’s largest marine protected area. Ongoing research and monitoring are required to show that the MPA meets its objectives and to ensure the MPA’s continued existence. Dr Eisert’s team travelled to Scott Base with Antarctica New Zealand in January, and she hopes analysis of the samples and images they collected will begin a valuable data set for Ross Sea minke whale research.